A study of the effect of religion on happiness has revealed that Christians are the happiest people in Europe. The study was an empirical analysis of the effect of religion on happiness, using data from three waves (2002/2003, 2004 and 2006) of the European Social Survey (ESS) covering 114,019 individuals in 24 different countries. It provided information on personal characteristics such as gender, age, income, subjective general health, marital status, main activity, number of children and the educational level of each individual among other things. A significant effect of belonging to a religion on happiness. Those who belong to a religion report higher levels of happiness than those who do not. 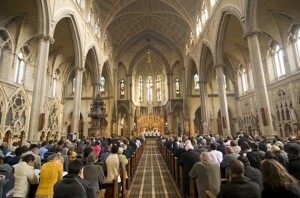 It found that religion or denomination has a significant effect on happiness. Protestants, other Christian religions and Roman Catholics report higher happiness levels whereas Orthodox and Eastern religions report the lowest. There seems to be a positive relationship between how religious a person is and happiness: the more religious, the happier. However, those who consider themselves “not at all religious” (0) have comparable levels of happiness to those who give themselves a 5 in the scale of religiosity. 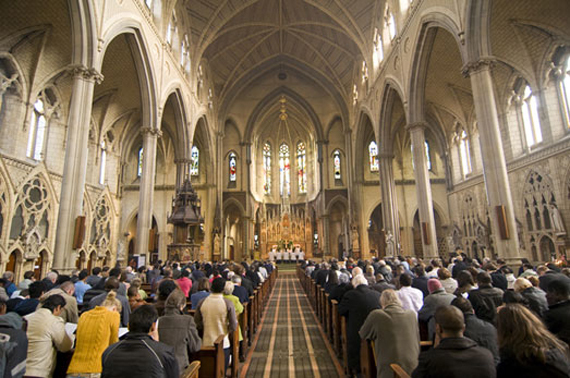 Frequency of attendance at services is likewise positively correlated with happiness: those who attend religious services every day say they are happier than those who never attend. 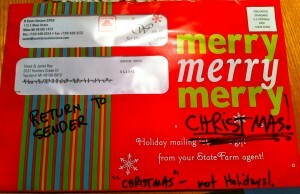 “Merry, Merry, Merry…” “OK, Merry What?” Return to Sender! My insurance agent sent out a promotional flier with a “Holiday Special.” Plastered on the front of the oversized envelop was “Merry, Merry, Merry!” Then nothing! Why not finish it with what we all expect — Merry CHRISTMAS! People are cowards and afraid to say something that 99% of people want to hear and 1% are adverse to. You can see what I did with his envelop below to the right. Then my son called them and said, “Why not just say Christmas?! If you can’t say the truth and realize that this whole season is around Christ and the vast majority of your customers are Christians, and the rest understand why you’d say Christmas, then why snub us all with your political correctness?” They got the point and promised to be more careful what they send out in the future. I dare say if one out of 10 Christians would speak out — the public denial of Christ Christmas would be over in two days. Retailers and others respond to their customers. So, tell them what you think and wish them a Merry CHRIST-mas! 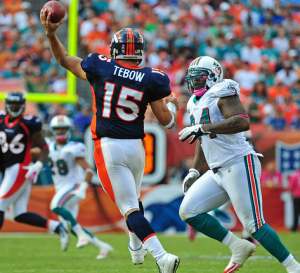 “On a brisk Thursday evening in mid-November, I sat high in the stands at a Denver Broncos home game, covering the ears of my 4-year-old son as the fans around us launched f-bombs at Tim Tebow, the Broncos’ struggling second-year quarterback. Mr. Tebow was ineffective and off-target for most of the game, and one of his more voluble and obnoxious critics was standing right in front of us. “And so it was. In the waning moments against the New York Jets, Mr. Tebow manufactured a 95-yard game-winning drive, punctuated by his own 20-yard touchdown dash. He brought the Broncos back from imminent defeat, just as he had done in previous weeks against the Miami Dolphins, Oakland Raiders and Kansas City Chiefs. “And when the shouting was over, Mr. Tebow did what he always does—he pointed skyward and took a knee in prayer. In postgame interviews, the young quarterback often starts by saying, “First, I’d like to thank my Lord and Savior Jesus Christ” and ends with “God bless.” He stresses that football is just a game and that God doesn’t care who wins or loses. 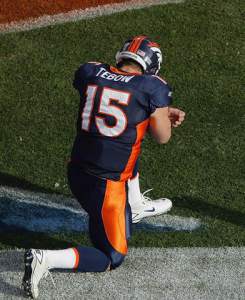 “This combination of candid piety and improbable success on the field has made Mr. Tebow the most-discussed phenomenon of the National Football League season. Most expert analysts still consider him poor material for a pro quarterback. An inexperienced passer with awkward throwing mechanics and the build of a fullback, he likes to run over defensive players, which is a no-no in the NFL, whose starting quarterbacks are expensive and hard to come by.